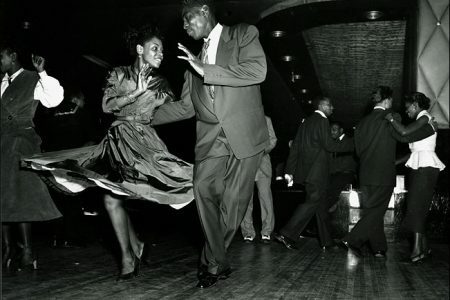 The Lindy Hop, developed in the 1920s and 1930s, is most often associated with the Swing Era of jazz history. The name derived from the hop, a dance move popularized in African American dance halls in New York during the 1910s and 1920s; the “Lindy” came into vogue after pilot Charles Lindbergh flew his historic “hop” across the Atlantic in 1927. The Lindy Hop dancers, known as Lindy Hoppers, became a tourist attraction at dance halls such as the Savoy Ballroom in New York during the 1920s. Significantly, the rise in popularity of the dance reflected the emergence of New York as the new the center of jazz performance after 1925. This geographic and musical shift away from New Orleans in the 1920s reflected the general decline of the Crescent City as a source of inspiration for jazz and dance performance. Nevertheless, bands and orchestras in New Orleans such as the New Orleans Owls, the Tuxedo Orchestra, and the Sam Morgan Band continued to be popular jazz dance bands throughout the 1920s. Whitey's Lindy Hoppers, from the 1941 film "Helzapoppin." Regarded as the best version of dancing the Lindy Hop ever put to film.